Just a few days after my defense, I started a contract position on the Speech and Data Ops Team at Google. The position is your standard Linguistics Project Manager Position on the Text To Speech Team, where I join three other former UCSC linguists. This makes it feel more like home (but with an upgraded StevCaf). 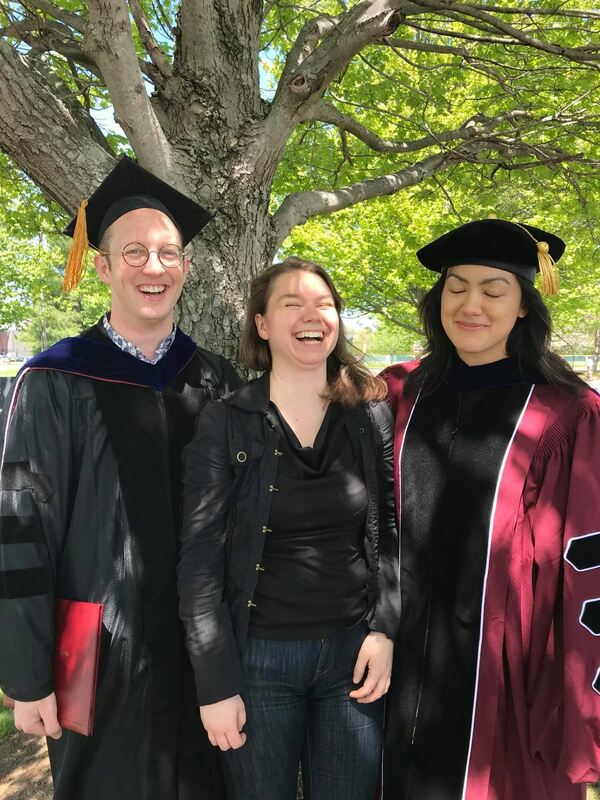 Congratulations to current faculty member Amanda Rysling and former slug Shayne Sloggett (BA ’10), who walked in the UMass graduate commencement on May 13th, since both defended and filed dissertations last year after the ceremony. Both also presented at LynSchrift18, the workshop celebrating Lyn Frazier, who is retiring this year. Amanda presented a joint talk with John Kingston titled “Regressive spectral assimilation bias in ambiguous speech sound perception.” Shayne presented a talk titled “Logophlexivity: When reflexives behave like logophoric pronouns.” The program can be found here. A paper by Ryan Bennett (PhD ’12 and current faculty member), Boris Harizanov (PhD ’14), and Robert Henderson (PhD ’12) has appeared in the latest issue of Linguistic Inquiry (LI). The paper, entitled “Prosodic Smothering in Macedonian and Kaqchikel,” proposes a novel analysis of dependent morphemes which idiosyncratically trigger prosodic restructuring of their hosts. Another paper by Boris Harizanov appears in this issue, entitled “Word Formation at the Syntax-Morphology Interface: Denominal Adjectives in Bulgarian.” The paper seeks to understand mismatches between syntactic representations and corresponding morphological representations. A paper by faculty member Ivy Sichel also appears in the issue, entitled “Anatomy of a Counterexample: Extraction from Relative Clauses.” The paper argues for an approach to extraction from RCs where locality is determined syntactically, in combination with a more fine-grained structure for RCs and a theory of how extraction interacts with the theory of locality.